Back together. My alignment numbers on the pass side still seemed weak after fixing this. Dropped marks on the ground from the rear of each torsion bar socket, made a line across that. Dropped marks at the face of each LCA real close to the lower ball joint and also dropped marks from the front ball joint bolt in the spindle. Both sides were less than 1/8" difference. Alignment numbers for DS I was able to get -.50* camber/+4* caster. PS I was only able to get 0* camber/+1.5 caster. Got kinda frustrated, started thinking about camber spacers and all that. Decided to see how much my weight in the drivers seat changed stuff around. My wife plus a puppy in the car and PS came around to -.3* camber and +2.75* caster. DS numbers changed to -.15* camber/+3.5 caster. slight adjustments to the DS and it's also at -.3* camber/+2.75* caster. I think I'm losing a full degree of caster from the rear of the car being higher than the front so I'm happy with 2.75* caster. If my EX wife were to sit in the drivers seat of my car, I'd need a block of wood under the frame rail to limit the compression of even my 1.15 torsion bars! Hey guys, sorry to bring back an old thread but this is the second time I've heard of the "binding due to moved pivot point" issue and it has me confused. I have a mechanical engineering background so I understand the tech-speak with suspension stuff to some extent. 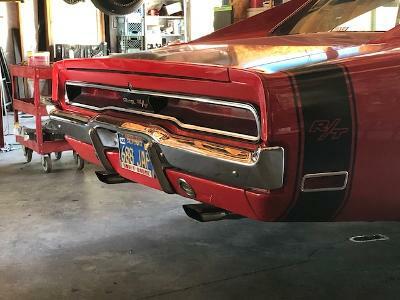 The thing is I installed adjustable (heim-jointed) strut rods on my '70 Duster and they made a very noticeable improvement in turn-in response and braking feel. When installing them you are supposed to assemble the LCA and strut rod to the K-member without a torsion bar and gradually adjust the strut rod shorter while simultaneously moving the LCA up and down through its full range of motion. On mine I just went till I started to feel it tightening up and barely pulling on the LCA then tightened the lock nuts. It still moved totally smooth through the full range of motion. If that was possible to achieve then where is this "binding" supposed to be happening? Suposedly the point of motion for the altered pivot point at the K frame for the strut rod changes the ark of the lower controll arm ball joint , and will change dynamic castor slightly more than the stock , vaque rubber biscut mounting.I feel the benifit far out weights the negative . What is the proper "spec" for adjusting these? Upon initial install [no t-bar], I adjusted them to where the LCA ran smoothest through it's range of motion. Now that the car has 1,500 miles or so, I am doing an alignment after things have settled and may want to revisit that. When you use the strut rod to dial in caster you are doing it wrong. Use the UCA to relocate the UBJ. There are a number of aftermarket tubular ones that are designed to add more than the stock UCA. When the forward pivot of your strut rod is not in line with the LCA pivot pin, you are doing it wrong. That is a design flaw, pure and simple. Easy to fix in the design stage, if you know what you are doing and not slapping some junk together to sell to the unsuspecting. that's basically what i did. with no torsion bar in the LCA there is a slight movement in the arm front to rear, i just pushed the arm forward at approximate ride height. adjusted the strut rod to that distance and then gave it an extra turn to lengthen it just a tad. dropped marks on the ground when it was all back together and measured to make sure everything was equal.